Ravenous Crepes is a brunch destination for locals, college students and weekend travelers in this upstate New York town located close to the heart of apple-growing country. Apples play a major role in these sweet and savory crepes, featuring maple-glazed tart apples, scrambled eggs, ham and cheddar, topped with maple-Dijon dressing. For Maple-Glazed Apples: In large sauté pan over medium heat, melt butter. Add apples; cook until they begin to caramelize. Add maple syrup; reduce heat to low. Continue cooking, stirring occasionally, until syrup begins to reduce and thicken. Strain apples and set aside to cool; reserve glaze. For Maple-Dijon Dressing: In stainless steel bowl, combine 6 oz. reserved maple glaze and mustard; whisk thoroughly to combine. 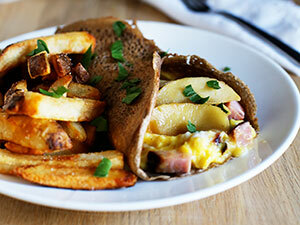 For Filling: Scramble 1 egg in small pan and place in a crepe. Add 1 oz. cheese and 1 oz. ham; top with 1 1/2 oz. maple-glazed apples. Close crepe and drizzle with Maple-Dijon Dressing.